Barrel worked with the team at SmartyPants to launch SmartyPaws, a new brand that brings premium vitamins to the dogs in your family. The new website, built on Shopify, helps introduce the personalized product line, carefully-selected ingredients, and story behind the brand. A core part of the website redesign was the product detail page, to showcase information on the variety of formulas for each dog’s size and stage of life. 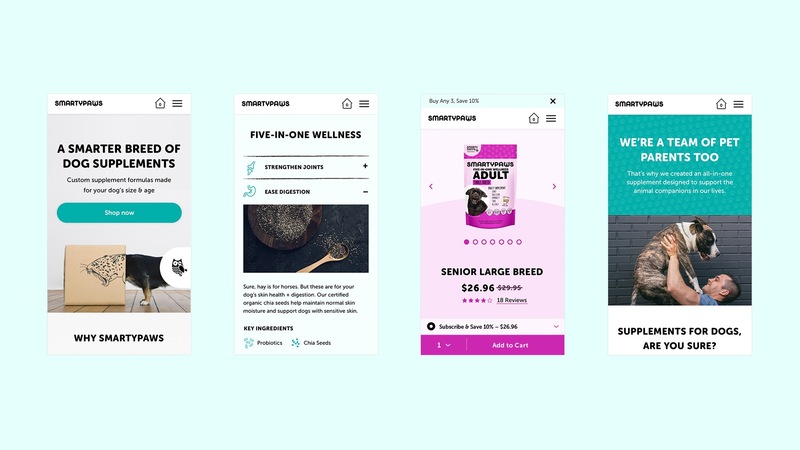 Reinforcing SmartyPaws’ carefully curated formulas, the product detail page clearly displays nutrition facts, reinforces the benefits, and exposes the simple, all-natural ingredients. To align with the package design, each size and stage’s product detail page changes color corresponding to the size. With so many customer shop on their phones, we optimized the mobile experience with a sticky add to cart button that allows the users to select subscription or one time purchase from any point on the page. For the past 12 years, Barrel has collaborated with numerous e-commerce brands to think strategically about their digital experiences. Barrel’s work with SmartyPaws adds to the agency’s growing roster of clients on Shopify Plus such as SmartyPants Vitamins, MOSCOT, Hurom, Gitman, Peach & Lily, and Sakara. Check out the site at smartypawshealth.com.